A sore throat or as it is known pharyngitis is characterized by any inflammation of the throat or pharynx. It is typically painful and may last for a relatively long time. It is usually caused by a viral infection in a large percentage of cases or it may be triggered by a bacterial or fungal infection or other irritants like certain chemicals or pollutants. For viral infections treatment will involve treating only the symptoms while with bacterial and fungal infections antibiotics or anti-fungals may be used to neutralize the infection. The conventional method of treatment involves taking pain reducers like ibuprofen, acetaminophen or aspirin and/or taking lozenges. Both methods will help to alleviate the associated symptoms fairly effectively. However if you prefer a more natural method of relief you may try a few of the following home remedies that are listed below. It is wise to consult a doctor if you believe that your throat condition may be more serious than a regular sore throat, this could indicate the presence of streptococcal bacteria (strep throat) or possible tonsillitis. The first type of natural remedy that may be used consists of gargling with salt water. This water should be warmed either on a stove top or in a microwave, do not boil the water because this will make it inappropriate for use as a gargling solution. Once the water is warmed dissolve the salt in it and gargle with the solution. This will generally have the welcoming effect of easing the pain and lessening the inflammation. You may also create a gargling solution from mango bark. Use about 10 ml of the fluid extract and combine with 125 ml of water. 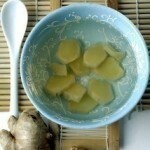 This is considered a very favourable method to use in treating a sore throat. It is also suggested that drinking a tea made from the blossoms of dried chamomile will alleviate the symptoms. It may be drank every 2-4 hours while symptoms persist. You may use honey and lemon to lessen the effects of a sore throat. First boil some water and then add some honey and freshly squeezed lemon juice to the water. Allow the mixture to cool for a few minutes and then sip the mixture. The honey will have the wonderful effect of coating and soothing the throat while the lemon will reduce the mucus present in the throat area. You will need to take this treatment while symptoms persist, possibly every few hours. Try to speak a lot less than normal to give your throat time to heal. Shouting or speaking too loudly or too much will aggravate a sore throat. Drink a lot of fluids; this will ensure that you will not dehydrate as a result of loss fluid during mucus production. Try to avoid alcohol and caffeine that may also have a dehydrating effect. You may also make a garlic tea as a natural home remedy for the condition.. Boil some water and then add a few cloves of garlic. Sip this like you would any ordinary tea. This will relieve some of the symptoms and help fight the existing infection.